1. Find a place for each kind of product and stick to it. With clear drawers, you always know where everything is. 2. Fill a votive holder with coffee beans and keep your brushes in it. If you're not into the smell of coffee, you can use dry white beans or whatever. This is some NEXT LEVEL organizational witchery. Wrap a cookie sheet in the paper or fabric of your choice, then glue small magnets to the back of each product. You can even frame it if you like. If you do this, watch out, because anyone who comes to your house and sees it is going to be really intimidated by how good you are at your life. 4. Put everything out in the open where you can see it. This amazing vanity is make of Ikea furniture and acrylic trays from a craft store. It takes less than an hour to assemble. Learn how here. 5. Deconstruct and decoupage old boxes. This pretty organizer is made of cereal and oatmeal boxes, but you can use whatever you have on hand. 6. You can also make a whole chest of cardboard drawers. 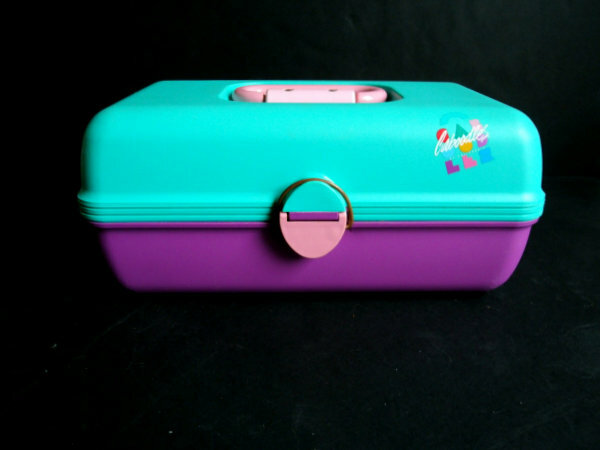 This one uses old Birchboxes, but, as with the organizer above, any kind of small boxes will work just as well. Instructions here. 7. Hang your products up and reclaim your precious bathroom counter space. No matter how much counter space you have in your bathroom, it will never be enough. It's a law of physics or something. This organizer is made of craft store pails, a shower rod, and ribbon. 8. Sew a little sleeping bag for your brushes. Aw, look at how snuggly they are now. 9. Or contain them in gold. These are just mason jars painted gold, but they look really fancy and Anthropologie-esque, don't they? Get to it! 10. Divide (and conquer) your drawers. Simple drawer inserts are great for decluttering a jumbled vanity. You can browse some inexpensive ones here. 11. Hanging organizer + makeup = genius. This is another way of reclaiming your beloved counter space. Stick this on the back of a closet door to make clutter is a thing of the past. 12. Use a magazine rack to bring order to stacks of big palettes. Palettes are the best things ever, but storing them is the worst. Pick up a magazine rack at a dollar store and you'll reclaim TONS of surface area from their bulky clutches. 13. Use a bead organizer to straighten stuff up. 14. And if all of this still seems like too much to manage, there's always this classic. Go the seventh-grade route and get yourself a Caboodle!